“Ascent” will use proven components and local expertise to design and build a small device carrying several cameras to the edge of space. The project will recruit local high school students interested in aerospace engineering to assist in the design and construction of the device, and the process will be documented on the project’s website. A project blog will discuss the technologies and physics at work. The public will be able to follow the creation of the device, view its launch, and track its flight online in real time, allowing the entire community to become “armchair astronauts” and experience the flight from the comfort of their own home. 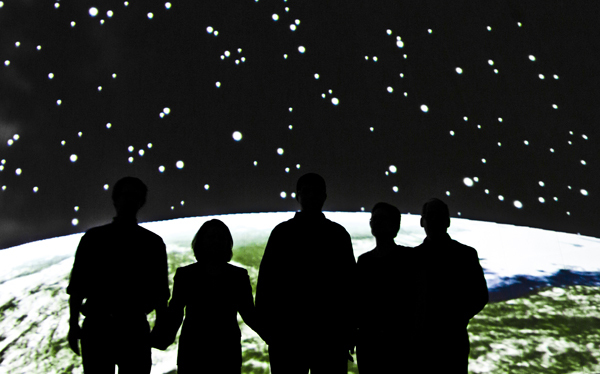 The heart of “Ascent” is community involvement, creating a space where the science and arts communities work together. 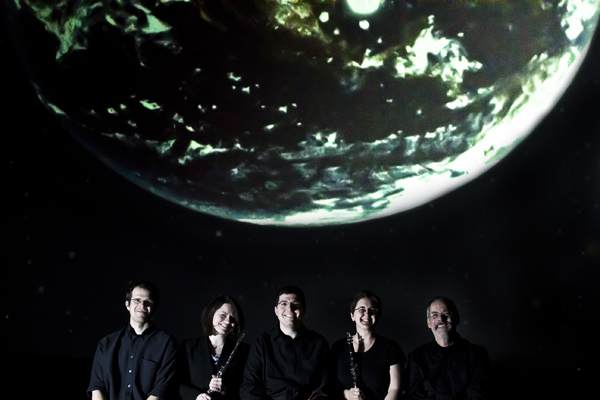 Dark Matter will then present an hour-long performance at Union Station’s Gottlieb Planetarium. During the performance, original electroacoustic music by Daniel Eichenbaum and Richard Johnson, performed live by flutist Rebecca Ashe and clarinetist Cheryl Melfi, will interact with the projected imagery on the Planetarium dome. The result will be a truly immersive environment for the audience that gives them the experience of a flight over Kansas City. Along the journey, astronomer Bob Riddle will offer narration discussing the project and comparing it to humankind’s history of reaching for the stars, from ancient balloons to the twentieth-century space race. Proof of concept was demonstrated in October 2010 when Kansas City amateur astronomers Fred Bruenjes and Jen Winter launched an eight-foot weather balloon and off-the-shelf camera and radio transmitter, that climbed over 100,000 feet above Kansas City. They captured images not only of Kansas City, but of the edge of the Earth’s atmosphere. Bruenjes and Winter successfully tracked the device using its broadcasted GPS coordinates and were able to plot, in real time, its position on Google Maps. Dark Matter will use a high-definition video camera and high-resolution digital camera to record images and video during flight, allowing them to fill the entire fifty-foot Gottlieb Planetarium dome with movies and images. Bruenjes and Winter will help with the design, testing, and construction of the device. In addition, MakeKC and the HMS Beagle science store have volunteered workshop space and additional technical expertise along with help recruiting local high school students. Composer Daniel Eichenbaum’s music has been performed and published throughout the United States, Europe, and Asia. Besides composing, he is a devoted teacher, working with students of all ages from the United States and abroad. From 2005–2007, he was Instructor of Music at Mahidol University in Thailand and also taught master classes in Myanmar. Mr. Eichenbaum was awarded an Inspiration Grant from the Metropolitan Arts Council of Kansas City to help fund his work on Dark Matter, which combines his love for music, science, and outer space. Composer Richard Johnson is a Doctoral Candidate in Music Composition at the University of Missouri- Kansas City. He has recently served as an adjunct there in the composition department as well as at community colleges in the Kansas City area, where he teaches topics in World Music and Audio Engineering. Richard is currently working on a series of pieces for electronics and soloist exploring quests for spiritual harmony in human history, while at the same time composing scores for local animation and video games. Clarinetist Dr. Cheryl Melfi is a founding member of Quadrivium, a mixed chamber ensemble specializing in electroacoustic music. She has performed throughout the United States and Asia, and has been a featured artist at music festivals and clinics including Music From Greer, the University of Minnesota’s Third Annual New Music Festival, UMKC’s Summer Composition Workshop, the Singapore Bandmasters’ Workshop, the Asian Symphonic Band Competition, Electroacoustic Juke Joint, and more. Currently she is Assistant Director of the Community Music and Dance Academy. Flutist Dr. Rebecca Ashe is a performing artist and representative for Trevor James flutes who has performed recitals throughout North America and Europe. A new music performer and collaborator, she has partnered with leading contemporary composers and has performed at new music festivals including SPARK, SEAMUS and the Electroacoustic Juke Joint. In 2010, she was the featured performing artist at Electronic Music Midwest. She has won local grants and national awards and will soon be releasing her debut CD. Astronomer Bob Riddle is adjunct faculty at Longview Community College where he teaches Astronomy online and in the classroom. Bob writes Scope on the Skies, a monthly feature of Science Scope Magazine, a National Science Teacher Association publication. When not teaching or researching for his monthly column and his web site Bob spends his time waiting for the International Space Station to fly over.